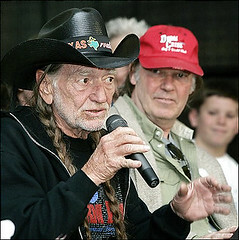 As usually, Willie Nelson and Family toured extensively in 2006. Getting to see Willie Nelson and Family live in concert is the best thing about being a fan. 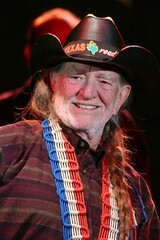 There is nothing like a Willie Nelson concert!. He sings these incredible songs, many of which he’s written himself, and all of them hits. He is an incredible guitar player, and standing in front of him and watching him play is a blast. My shows started in January, in Reno, and ended with a magical show at Red Rocks in Colorado in September. In 2006 Wille released ‘Songbird’, produced by Ryan Adams and backed up by Adams’s band, the Cardinals. Willie continues to surprise with his fresh collaborations. Edgey, interesting, with willie’s sweet familiar phrasings surrounded by this electric wall of sound from the Cardinals. 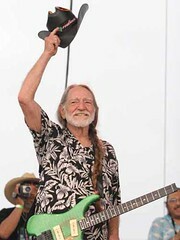 Willie hosted another Fourth of July Picnic in 2006, once again at the Stockyards in Fort Worth, Texas. It was a perfect picnic, with Willie, and his family and friends, and a long day filled with great music: Billy Joe Shaver, Kris Kristofferson, Ray Price, Johnny Bush, Shooter Jennings, and so many more,. We had lots of sun, and rain and mud and beer, and it was a great time. Carl’s Corner, just outside of Fort Worth, hosted pre-picnic warm-up concerts the week before, which culminated with a concert late into the night on July 3, 2006 with Willie, Billy Joe, Nitty Gritty Dirt Band, and more. We listened to music, partied with our friends all day, and then Willie came on stage after midnight. Then in the early morning hours we all drove back to Fort Worth and got in line for the Picnic the next day. On July 2, 2006, Willie joined his sister Bobbie, Leon Russell and friends for a service at the Methodist Church in Abbott, Texas. Willie and Sister Bobbie grew up in Abbott, where they lived with their grandparents, and attended the church as children. When Willie and Bobbie learned that the church was struggling financially and the building was for sale this year, they purchased the Church. Willie invited church members, Abbott residents, family, friends and fans to attend, and it was an amazing day filled with Grace. The church was full, and they let the rest of us sit outside under tents around picnic tables where weÂ watched and listened to a live feed of the service. Willie sang gospels, and also sang his ‘What Ever Happened to Peace on Earth’ song. After the service Willie stayed and talked with neighbors and fans, posed for pictures and signed autographs, then treated us to a delicious organic picnic under the tents. The video of the service is available for sale by the Methodist Church with proceeds going to fund scholarships for local teens. Willie wrote and published another book this year, and to me it is his greatest. 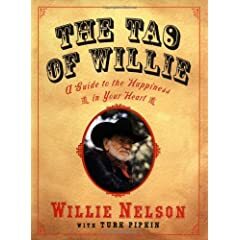 The book is so personal, and I imagine it must be like sitting with Willie, and listening to his stories about growing up in Texas, being a song writer and singer, touring, raising a family. His book is inspiring, funny and entertaining. get to learn more about Willie and his life in this book, interwoven withÂ jokes andÂ pure inspiration. What can I say about Farm Aid?Â Willie and other board members Neil Young, John Mellencamp,Â Dave Matthews hosted another fundraiser for American Farmers in September, this time in New Jersey.Â In twenty years of operation, Farm Aid has raised more than $29 million dollars.Â Farm AidÂ is only one of many charitable events Willie supports andÂ lends his name to each year. Willie recorded two albums with Atlantic Records:Â Shotgun Willie in 1973, and Phases and Stages, in 1974.Â In 2006 Rhino RecordsÂ released a 3-cd boxed set, which includes these two Atlantic Records albums, along with a cd of a complete show recordedÂ live at Austinâ€™s TexasÂ OpryÂ House, which was never released, because he was changing labels.Â Also included are some extensive liner notes and over two dozenÂ outtakes, demos, and alternate versions of songs.Â Â Willie released the concept album â€˜Phases and Stagesâ€ cd even before everyone went crazy over his concept album â€œThe Red Headed Stranger’, Shotgun Willie is one of his best ever, and the unreleased concert show. this is a great boxed set. Willie posed with young outlaws Shelby Lynn and Scooter Jennings on motorcycles, for the November 2006 Vanity Fair magazine. Willies supports the troops in many ways, but he has never hidden his opposition to the Iraq war.Â He wrote this anti-war song at Christmas 2003, following the US Invasion of Iraq. His first public performance of the song, as far as I know, was on January 3, 2004,Â at an Austin fundraiser for Dennis Kucinich, whenÂ the progressive Democrat was running for president.Â In November 2006, Willie released a digital version of this song, recorded with sons Lukas and Micah, Michael McDonald, Jack Johnson, Ben Harper, Pat Simmons, Sr, Pat Simmons, Jr., Amy Holland, Marty Dread, Donnie Smith, and David Choy. Proceeds were targed for the benefit the National Veterans Foundation. 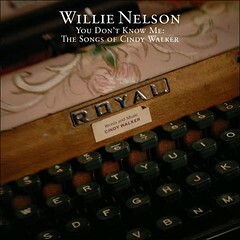 It”s available for purchase at all digital music stores, as well as at www.nvf.org. And whatever happened to peace on earth.